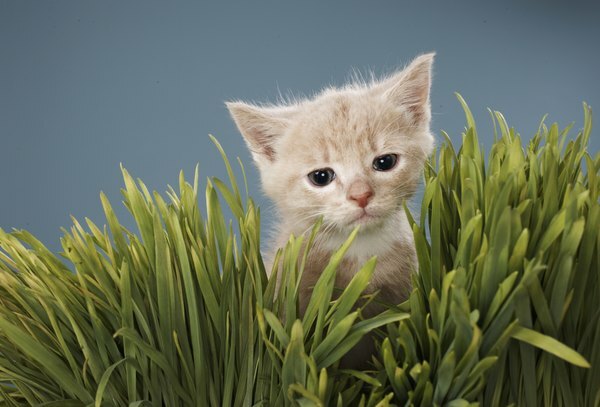 A stray kitten may have gingivitis from a virus or eating kibble. A stray kitten stumbles across your path and you decide to rescue the young wanderer. Then it's time to get your new feline friend healthy. One of the more common problems you might face in your young companion is gingivitis, or inflamed gums. Gingivitis is the fancy name for inflammation of the gums. Often cats also have bad breath and tartar on their teeth, especially along the gum lines. As the inflammation gets worse, the gums sometimes pull away from the teeth. Bacteria and food particles get stuck in the gaps, causing infections, tooth decay and pain. Luckily, most cases of gingivitis can be reversed before permanent damage sets in. While most stray kittens have been eating food other than kibble, some may have become lost from a home where they ate kibble or may have been stealing kibble from outdoor food bowls. According to veterinarian Lisa Pierson of CatInfo.org, cats' teeth are not designed for chewing, so many cats swallow their kibble whole. For those who do chew the kibble, the tiny bits of dry food can often become lodged in the gums near the tooth line, especially if the gums are already inflamed and pulling away from the teeth. This may happen especially in kittens as baby teeth are falling out and new teeth are growing in. If you find a stray kitten with gingivitis, she may have been relying on kibble in a previous home or while on the streets. Dr. Pierson recommends a diet with foods that resemble your feline friend's wild counterparts, including raw meat and bones. The tearing of the meat and chewing of the bones is more effective in cleaning cat teeth than kibble is, and can help the stray kitten recover quicker from the gingivitis. Calicivirus is one of the most virulent viruses that affect cats, and is a common cause of gingivitis in kittens. In fact the "C" in the typical FVRCP annual cat vaccine stands for calicivirus. The worst symptom of calicivirus may be the gingivitis, which often develops into stomatitis. Gingivitis caused by calicivirus is often very painful, can cause mouth ulcers and may cause the kitten to stop eating. A stray kitten who has never been vaccinated has a fairly high risk of being infected with calicivirus, so it's a good possibility to investigate with your veterinarian. Perhaps the toughest cause of gingivitis to diagnose and treat is immune system malfunctions. Sometimes viruses like feline leukemia (FeLV) and feline immunodeficiency virus (FIV) can cause the immune system to overreact and cause gingivitis. Unfortunately, neither FIV or FeLV is curable, but treatments can lessen the effects of the virus. A simple blood test can usually tell you if the stray kitten you have found has FIV or FeLV. Sometimes, though, the cat immune system just reacts to plaque, tartar or even some foods, causing gingivitis. If you and veterinarian have ruled out the other causes of gingivitis in a stray kitten, you may have to just treat the symptoms without ever really knowing the cause for sure. What Are the Dangers of Bringing a Stray Cat Indoors? Can Young Kittens Get the Flu?